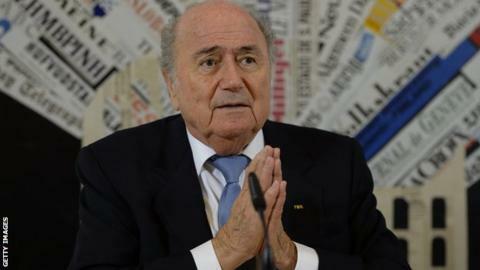 Fifa president Sepp Blatter says he has a clean conscience and anyone who calls him corrupt should be sent to jail. The 79-year-old announced last month he will leave his role following a high-profile investigation into corruption at world football's governing body. Blatter told German magazine Bunte he has done nothing wrong and will go to heaven when he dies. "Anybody who calls me corrupt because Fifa is corrupt, I can only shake my head," he said. "Everybody who says something like that should go to jail," he added. Earlier this year, Dominican Republic FA president Osiris Guzman likened Blatter to Jesus, Moses, and political figures Nelson Mandela and Winston Churchill. "My faith has given me strength during the last week. I am a religious person and pray, too. I own a golden cross that has been blessed by Pope Francis," said Blatter. "I believe I will go to heaven one day. But I believe there is no hell. I disagree with the Pope on that." Two criminal investigations into alleged Fifa corruption are ongoing and Blatter is reportedly under investigation by US officials. Blatter announced on 2 June he would step down from the Fifa presidency at an extraordinary congress to be held between December and March. However, he has since stated he has not resigned and is thought to be considering standing for re-election.